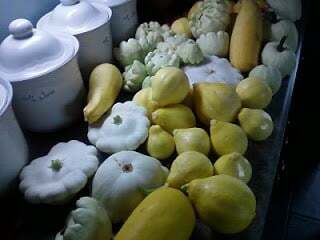 Although we are not drowning in zucchini and summer squash this year — the picture is from last year — I know a lot of people have been blessed with an abundance of summer squash of all varieties, so here is what I would be doing if the borers had not visited my garden a few too many times this summer. Stir-fried Summer Squash — quick, easy, and nutritious! I made this last year on The Morning Blend, a morning show in Milwaukee. Click on the link to get the recipe for summer squash with a basil chiffonade. You can also create a southwest flavor by adding a dash of chili powder and a chopped habañero or jalapeño instead of the basil. 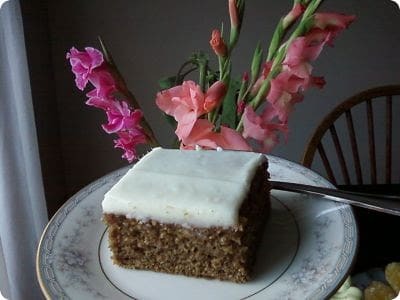 Zucchini Spice Cake — one of my favorite desserts, especially with goat cheese frosting! 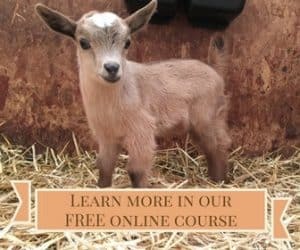 Click on the link for the recipe. Drop by spoonfuls into an inch of hot oil and fry until browned on both sides. Zucchini Pancakes — for a low-fat option, follow the above recipe, but fry in a non-stick pan with no added oil.